My 24 hour journey (a 13 hour flight to Singapore, a 2 hour layover, a 7 hour flight to Tokyo, and then 2 hours of immigration and travel into Tokyo) starts with breakfast in the Singapore Airlines lounge, a benefit of being a Singapore Airlines regular flyer. Breakfast included a bacon roll, probably my last taste of ‘proper’ bacon until the middle of August – for the next six weeks, when bacon is on offer, it will be in the US style, thin strips without the meat part. In so many ways Singapore are my favourite airline, so I hope everything lives up to my expectations. The bad news is that the plane sounds like it is going to be very full. I have aisle seats on both legs (seat 59D on both legs – I often try to choose the same seat number, but for no real reason, just seems right), but it sounds like I won’t have the luxury of an empty seat next to me. I need to make sure that over the next 3-4 days I do plenty of work on the Japanese Hiragana and Katakana scripts – I have promised my tutor, Yamamoto-san, that I will know them by Thursday. There are 48 basic Kana (i.e. 48 Hiragana and 48 Katakana), but then there are also 25 diacritics (such as? and?) and 21 digraphs (such as??) – so there are about 100 Katakana and 100 Hiragana items to learn – wish me luck! Although I travel a lot for work, this will be my first extended trip of exploration since about 1981 – so it will be interesting to see how well I cope with an extended visit – at the moment I am experiencing both excitement and some trepidation. When I bought some Japanese Yen at the counter the teller asked my if it was for business or leisure. When I told him I was off to study Japanese he said it was good to see somebody my age still keen to study – we need to change expectations, IMHO. 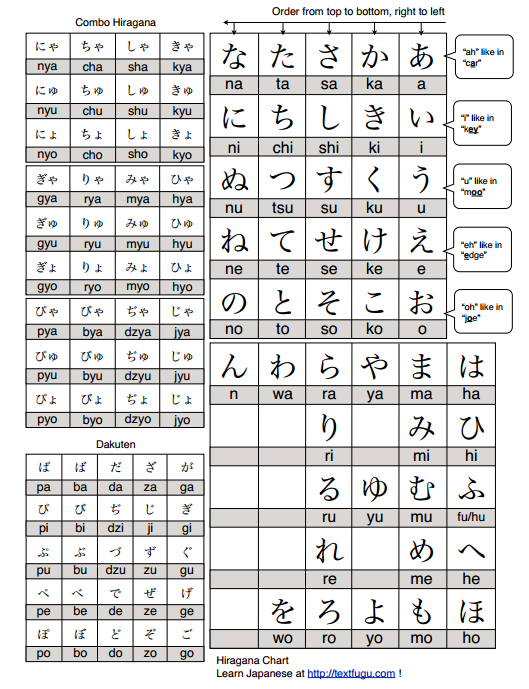 Here are the Hiragana characters, from a chart on the Textfugu site – I am hoping some of you will visit their site, clicking the image below takes you to the version on their site. This entry was posted in Blog article, Japan, Uncategorized on June 29, 2014 by Will Poynter. I am on my way to Tokyo to spend a month studying Japanese. I have an apartment booked for one month and I meet my tutor on Thursday. How will it go? Well, my optimism is high, but over the last 57 years I have not shown any aptitude for languages, so my optimism has to be tempered with some realism/concern. Tonight I am stopping at the Yotel at Heathrow, as I am flying Sunday morning, and getting from Nottingham to Heathrow on a Sunday morning is quite a problem. The Yotel is probably quite a nice foretaste of Japan as it is a capsule hotel, something we often associate with Japan. My room is about 2 metres by three metres and has a bed, a desk, an area to get changed, a toilet, shower, and sink. The internet is free as are coffee and tea. 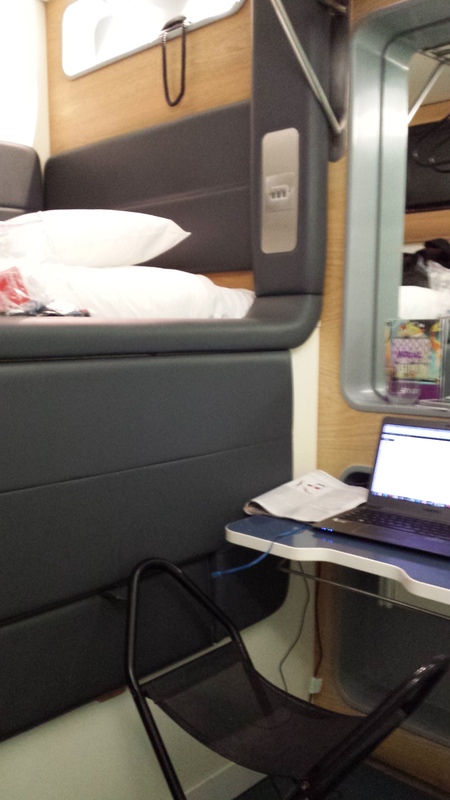 The bed is interesting, the good news is that it is comfortable, but the interesting thing is that my bed is over the bed in next cabin (in the picture you can see I step up to my bed, so the bed in the next Cabin will effectively be underneath me. As well as meeting my needs really well, the Yotel is great value (by UK standards), tonight is costing me £71. Tomorrow I am flying Singapore Airlines to Singapore, where I change planes and fly on another Singapore Airlines to Tokyo. The slightly off route is because I am spending a week in Singapore on my way back to the UK, for the Singapore MRS Conference, and this route is bar far the cheapest, and anyway I really enjoy Singapore Airlines. This entry was posted in Activities, Blog article, Japan, Uncategorized on June 28, 2014 by Will Poynter.